Willis, E., Tucker, G. & Gunn, C. (2003). Developing an Online Master of Education in Educational Technology in a Learning Paradigm: The Process and The Product. 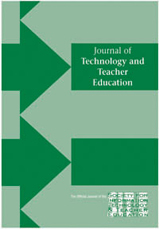 Journal of Technology and Teacher Education, 11 (1), 5-21. Norfolk, VA: Society for Information Technology & Teacher Education. Retrieved April 20, 2019 from https://www.learntechlib.org/primary/p/17792/.